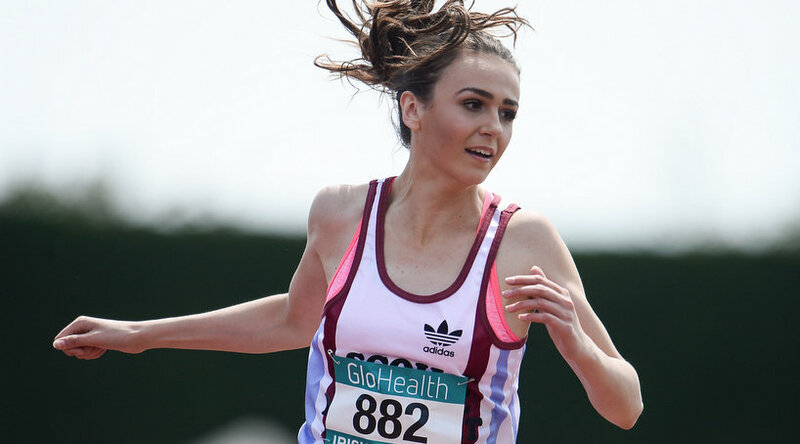 It was a case of the girls stealing the show on a day of glorious sunshine at the centenary GloHealth All Ireland Schools Track and Field Championships in Tullamore today (June 4). Michaela Walsh (SM & P Swinford) won the Lar O'Byrne athlete of the meet award for winning the shot put senior girls' shot put in 14.91m and a new hammer record of 56.90m. She also led her school to the senior girls' team title. Sharlene Mawdsley (St Mary’s Newport) was equally impressive as she captured double gold in the senior girls' sprints in record time - Mawdsley won the 100m in 11.80 (-0.4 wind) and the 200m in 23.62 (-0.2) wind. Not to be outdone was Ciara Neville (Castletroy College) in the intermediate ranks as she bagged triple gold - the 100m in 11.86 (-0.8), the 200m in 24.67 (+0.0) and a blistering anchor leg to nip the victory on the line. Another star in the girls' sprints was Patience Jumbo Gula (St Vincent’s Dundalk) who won the 100m in 12.28m (-0.9) and 200m in 25.35 (-1.7). Star of the boys' sprinters was Aaron Sexton (Bangor Grammer) who set a new intermediate record in the 100m of 10.86 (+1.3) and took gold in the 200m in 21.85 (-0.3). In the junior girls’ discus Megan Lenihan (Hazelwood College Dromcollogher) bettered Marita Walton’s 41-year-old record of 38.28m with a stunning 39.56m. Sarah Healy (Holy Child Killiney) was different class in the U16 girls’ mile with a new record of 5:03.57. There was an impressive intermediate girls' pole vault record by Ellie McCartney (Belfast HS) of 3.60m ahead of Emma Coffey (St Angela’s Cork) 3.20m and Clodagh Walsh (Davis College Mallow) third in 3.00m – all three bettered the record set by McCartney last year of 2.95m. Jordan Hoang (Colaiste Choilm Tullamore) hop, skipped and jumped out to 14.35m to win the Olympic trophy in the senior boys’ triple jump ahead of Shane Joyce (Ashbourne CS) in second in 14.07m and Ian Brennan (St Columba’s Stranolar) in third in 13.57m. Arlene Crossan (Loreto College Letterkenny) had a commanding victory in the senior girls’ 400m hurdles in 60.87 – not far outside the record of 60.63 seconds. Lucas Moylan (Patrician Newbridge) edged a high quality junior boys’ high jump in 1.88m ahead of Nelvin Appiah (Moyne CS Longford) with 1.85m and Troy McConville (Lurgan Junior HS) with 1.79m. Amy Rose Farrell (Mount Anville) stuck to the form books to win the intermediate girls' 3,000m in 10:15.99 - she pulled away from Abbie Taylor (St Gerard’s) who was second in 10:17.73 in the closing stages. Jack O’Leary (Clongowes) won a high quality senior boys 5,000m in 14:54.65. Ailbhe Doherty (St Flannan’s Ennis) attempeted an ambitious double in the minor girls' - after winning bronze in the 100m in 12.43, she won the 800m in 2:18.18 in record time. It was a fascinating day of competition with multiple records and 120 events which was run with precision timing from 9am to 6pm. (w: -1.6) 1, Chisom Ugwueru, St Flannan's Ennis, 11.89. (w: 2.5) 1, Nikolka Stevankova, Laurel Hill SS Limerick, 12.19. 1, Ailbhe Doherty, St Flannan's Ennis, 2:18.18. 1, St Vincent's Dundalk 51.82. 1, Jennifer Hanrahan, Our Lady's School Dublin, 5.33m, w:0.9. 1, Aoibhin McMahon, St Vincent's Dundalk, 12.73m. (w: -0.9) 1, Patience Jumbo Gula, St Vincent's Dundalk, 12.28. (w: -1.7) 1, Patience Jumbo Gula, St Vincent's Dundalk, 25.35. 1, Daniella Jansen, St Columba's Stranolar, 2:19.00. 1, Saoirse O'Brien, SH Westport, 4:41.99. (w: 1.9) 1, Holly Mulholland, Lismore Comp Craigavon, 11.36. 1, Wesley College Dublin 51.90. 1, Ciara Kennelly, St Brigids Killarney, 1.65m. 1, Ella Duane, Cross & Passion Kilcullen, 2.65m. 1, Lauren O'Leary, Nagle Rice Doneraile, 5.49m, w:-0.1. 1, Harriet Platt, Strathearn School, 9.96m, w:NWI. 1, Ciara Sheehy, St Marys Charleville, 13.12m. 1, Megan Lenihan, Hazelwood Col. Dromcollogher, 39.56m. 1, Shauna Linehan, Colaiste Treasa Kanturk, 41.47m. 1, Megan Lenihan, Hazelwood Col. Dromcollogher, 40.60m. 1, Siofra O'Dea, St Joseph's Spanish Point, 5:37.21. (w: -0.8) 1, Ciara Neville, Castletroy College, 11.86. (w: +0.0) 1, Ciara Neville, Castletroy College, 24.67. 1, Lauren Cadden, Ursuline Sligo, 40.05. 1, Davicia Patterson, Hunterhouse Belfast, 2:15.06. 1, Claire Rafter, Ursuline Thurles, 5:04.54. 1, Amy-Rose Farrell, Mount Anville Dublin, 10:15.99. (w: -0.2) 1, Miriam Daly, Scoil Mhuire Carrick on Suir, 11.70. 1, Miriam Daly, Scoil Mhuire Carrick on Suir, 42.80. 1, Laura Nicholson, Bandon Grammar School, 5:12.18. 1, Sommer Lecky, Strabane Academy, 1.78m. 1, Ellie McCartney, Belfast HS, 3.60m. 1, Kate O'Connor, St Vincent's Dundalk, 5.68m, w:-0.9. 1, Kate Taylor, Coláiste Muire Ennis, 11.33m, w:0.9. 1, Marguerite Furlong, St Mary’s New Ross, 11.37m. 1, Marguerite Furlong, St Mary’s New Ross, 33.15m. 1, Jade Williams, Bailieborough CS, 59.09m. 1, Kate O'Connor, St Vincent's Dundalk, 40.78m. 1, Niamh O'Connor, St Wolstan’s Celbridge, 9:05.26. (w: -0.4) 1, Sharlene Mawdsley, St Mary's Newport, 11.80. (w: -0.2) 1, Sharlene Mawdsley, St Mary's Newport, 23.62. 1, Molly O'Reilly, Loreto Dalkey, 56.00. 1, Amy NíhAmaill, Colaiste Oiriall Monaghan, 2:14.66. 1, Nadia Power, St Mac Dara’s Dublin, 4:44.46. 1, Aisling Joyce, Yeats College Galway, 10:00.23. (w: -1.2) 1, Megan Marrs, Strathearn School, 13.78. 1, Arlene Crossan, Loreto College Letterkenny, 60.87. 1, Eimear Fitzpatrick, Our Lady’s Terenure, 5:03.86. 1, Phoebe Tan, Methodist Col Belfast, 1.66m. 1, Laura Cussen, Colaiste Choilm Ballincollig, 3.00m. 1, Tara Jenkins, Sion Hill Dublin, 5.29m, w:0.5. 1, Lydia Mills, Ballyclare High, 11.39m, w:-0.3. 1, Michaela Walsh, SM&P Swinford, 14.91m. 1, Niamh Fogarty, St Joseph's Rush, 42.72m. 1, Michaea Walsh, SM&P Swinford, 56.90m. 1, Orlaith O'Brien, Yeats College Waterford, 40.22m. 1, Orla Delahunt, Ursuline Sligo, 16:11.04. 1, Sarah Healy, Holy Child Killiney, 5:03.57. (w: 1.3) 1, Mervin Shalamba, Mercy Mount Hawk Tralee, 11.44. 1, Jakob Swann, Bangor Grammar, 2:09.11. (w: 2.7) 1, Iarlaith Golden, St Colemans Claremorris, 11.56. 1, Mercy Mount Hawk Tralee 48.14. 1, Michael Farrelly, St Fintans Sutton, 5.98m, w:1.1. 1, Adam Sheridan, Rice College Westport, 13.61m. (w: -0.8) 1, Conor Crowe, St Patrick’s Keady, 11.58. (w: 0.9) 1, Nelvin Appiah, Moyne CS Longford, 23.53. 1, Louis O'Loughlin, Moyle Park Dublin, 2:00.78. 1, Ben Jones, Pres Bray, 4:16.15. (w: 0.1) 1, Ethan Williamson, Clounagh Junior HS, 11.63. 1, Mercy Mount Hawk Tralee 46.15. 1, Lucas Moylan, Patrician Newbridge, 1.88m. 1, Adam O'Dwyer, Thurles CBS, 3.10m. 1, Sean Carolan, St Mary's Newport, 6.16m, w:-0.2. 1, Ethan Williamson, Clounagh Junior HS, 11.77m, w:1.1. 1, David Siegel, Tralee CBS, 13.56m. 1, Chris Cosgrave, St Michaels Dublin, 39.97m. 1, Robert Higgins, St Mary's Edenderry, 49.01m. 1, Oisin Lane, Mercy Ballymahon, 5:48.14. (w: 1.3) 1, Aaron Sexton, Bangor Grammar, 10.86. (w: -0.3) 1, Aaron Sexton, Bangor Grammar, 21.85. 1, Tony Odubote, Rice College Ennis, 49.99. 1, Niall Harvey, Pres Carlow, 1:56.56. 1, Rory Lodge, St Kieran’s Kilkenny, 4:43.68. 1, Cian Kelly, Knockbeg College Carlow, 9:15.78. (w: -0.1) 1, Alex Clarkin, Castleknock CC, 13.24. 1, Tony O'Connor, Naas CBS, 56.78. 1, Ruarcan O'Gibne, Col Lú Dundalk, 4:36.60. 1, St Flannan's Ennis DNS. 1, Ryan Carty-Walsh, Good Counsel Wexford, 2.00m. 1, Shane Martin, Belfast RA, 4.00m. 1, Joseph Miniter, CBS Ennistymon, 6.54m, w:1.4. 1, Brendan Lynch, St Brigids Col Loughrea, 13.17m, w:-1.2. 1, James Kelly, Royal & Prior Raphoe, 16.12m. 1, Darragh Gaffney, St Finians Mullingar, 48.29m. 1, Brendan O'Donnell, St Eunan's Letterkenny, 64.66m. 1, Liam Connaughton, St Mary's Drogheda, 55.10m. 1, Adam McInerney, Patrician Newbridge, 10:00.04. (w: 0.1) 1, Sean Lawlor, Kylemore College Dublin, 10.80. (w: 1.2) 1, Cillian Greene, Presentation Athenry, 21.59. 1, Christopher O'Donnell, Magh Ene College Bundoran, 48.07. 1, Gary Campbell, St Mary's Dundalk, 1:54.87. 1, Kevin McGrath, St Pats Navan, 3:58.68. 1, Jack O’Leary, Clongowes College Kildare, 14:54.65. (w: -0.8) 1, Jack Murphy, CBC Cork, 14.98. 1, Cathal Locke, Crescent College Comp SJ, 54.55. 1, Tadhg McGinty, SM&P Swinford, 6:08.45. 1, Bandon Grammar School 42.71. 1, Dion Ryan, Watepark College Waterford, 2.00m. 1, Yuri Kanash, St Augustines Dungarvan, 4.40m. 1, Ian Brennan, St Columba's Stranolar, 6.75m, w:0.3. 1, Jordan Hoang, Col Choilm Tullamore, 14.35m, w:-0.8. 1, Anu Awonusi, Kilkenny College, 16.19m. 1, Eoin Sheridan, CBS Mullingar, 48.60m. 1, Stephen McCorry, Belfast RA, 52.68m. 1, Shane Joyce, Ashbourne CS Meath, 56.92m. 1, Anthony Tobin, High School Clonmel, 13:37.64. 1, Darragh McElhinney, Colaiste Pobail Bantry, 4:33.35.